What can a giraffe do when it’s most nutritious food is out of its reach? You might wonder can anything be out of reach for a giraffe. Not by a few inches, but feet. On a night when my mind was fried from the day’s work, all I wanted was to watch something mindless on television. Lots of mindless things there to choose from! But I settled on a new NatGeo program about wild life in the Sahara. The show focused on the giraffe’s need for water and how they have adapted to living in a place that gets a mere two inches of water every year. Of course, the foundation for adaptation was due to evolution, but that comes with the territory of nature shows. However, I watched through another grid. Giraffes can go up to three weeks without water, but they still need to hydrate. Part of their need comes from the morning mist that coats the many low-lying plants with some moisture. And, I thought this was a clever bit of sleuthing, they follow elephants to watering holes. Smart, very smart. But leaves and dew drops aren’t enough for these huge creatures. They also need protein. But they are not carnivores. The challenge is that the protein they need is literally out of their reach. They get this protein from peapod like clusters hanging from a tree that is above their reach. Not only that, but the pods are also filled with moisture for their thirst. Solution? Call in the elephant to help. Elephants come to these trees and use their heads and body weight to shake the pods lose from their stems so they fall to the ground. Then the dinner bell sounds and giraffes and other Saharan animals, along with the elephants, take as much as they need. When it’s elephant feeding time in the desert, it’s a feast for all. This got me thinking about God’s glory revealed in this interchange of animals in his creation. God owns them all and takes the responsibility for feeding them all from his hand: “You open your hand; you satisfy the desire of every living thing” (Ps 145:16). “It is God who directs the lives of his creatures; everyone’s life is in his power” (Job 12:10). I’ve often wondered, but quickly quit, about what it takes to feed all living things on the planet in a single day. Massive job. But God does it, day in and day out – and we are included in that supply. So, to feed the giraffe, God calls on the elephant to help out. As I watched, I imagined God speaking to the elephant and telling him it’s time for lunch and he is God’s “chef” to go to work providing food for the chow line. How glorious is that? God opens his hand and provides food for all his living creatures. Give thanks over your MacDonald’s lunch today! 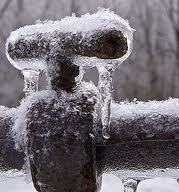 Frozen pipes can be a disaster in any home. In an RV, frozen pipes can bring “RVing” to the level of catastrophe. Last week, temps got down into the single digits at night and teens during the day. After two days, our camper’s waste water systems were icebergs. The drains were the problem. I called for backup. Actually, one RV repairman said all that we could do was to put heat lamps under the pipes, skirt the camper so that the winds were blocked, and wait for the temps to warm. So, we did that. I also put a heat wrap around one of the drains, just to be sure of a good thaw. Basically, we couldn’t leave the trailer for three days while we waited for the heat lamps, insulating wrap and moderating temps to do their work. This all started on Tuesday. By Thursday, I was hinting to my wife that it was time to go home. I had had enough of fighting brutally cold weather, jerry-rigging hoped for remedies, fearing massive costs for damaged tanks and drain pipes and generally being frustrated from the purposes of the sabbatical. Well, OK, I did more than hint – I whined and brooded. She said we were going to trust God. After several trips to Home Depot and Lowe’s for supplies to remedy the problem, by Friday we got the first glimpse of a little progress. I heard some water trickle down the drain. By Sunday it warmed up enough that when I pulled the knives to drain the tanks, they flowed easily. By Monday, we removed the plastic skirting around the camper (not allowed by camp ground policy but the hosts gave us a pass so that we could unthaw), the temps rose into the 50’s and we flushed out the tanks and added some anti-freeze. This whole episode had a point other than figuring out how to thaw out drain pipes. It was what happened on Sunday morning, during the sermon, that got me to thinking about the connection between frozen pipes and cold hearts. The pastor said that everything God does in our lives, what we might call “our circumstances” has a purpose. Our job is to ask God to reveal what that circumstance is all about. Now, I’m pretty well convinced that this sabbatical originated in God’s mind. I’m even convinced that doing it in Louisville, KY in the dead of winter in a camper was his idea too. I was not convinced that frozen pipes should have been part of the circumstance, until I heard those words spoken by the guest preacher. What could this circumstance possibly have to do with me? It wasn’t hard to make the connection with frozen pipes as the visual aid. The way that you thaw out a frozen pipe is with heat. Not blazing fiery flames, but with warmth at just the right distance so as not to melt the plastic pipe but close enough to melt the icebergs within. My heart has been cold toward God at times. By Thursday, it was like the Arctic. But on Friday, Nita and I slept in, spent time in the word with a cup of coffee, ate breakfast and talked about what we had learned of God during our devotional time. The word was close enough to warm the icebergs of my heart without harm. The word of God is always like that. Its rays of truth and life penetrate the coldness of iceberg hearts. The Christian heart needs the word to make sense of the circumstances that we find ourselves in. “The word is near you, in your mouth and in your heart” (that is, the word of faith that we proclaim); because, if you confess with your mouth that Jesus is Lord and believe in your heart that God raised him from the dead, you will be saved.” (Rom 10:8, 9).